Yu-Wen Wu’s WITH/OUT WATER outdoor art installation glowed on Chinatown’s Hudson Street this past Saturday. Photo by A-VOYCE youth, Lee-Daniel. 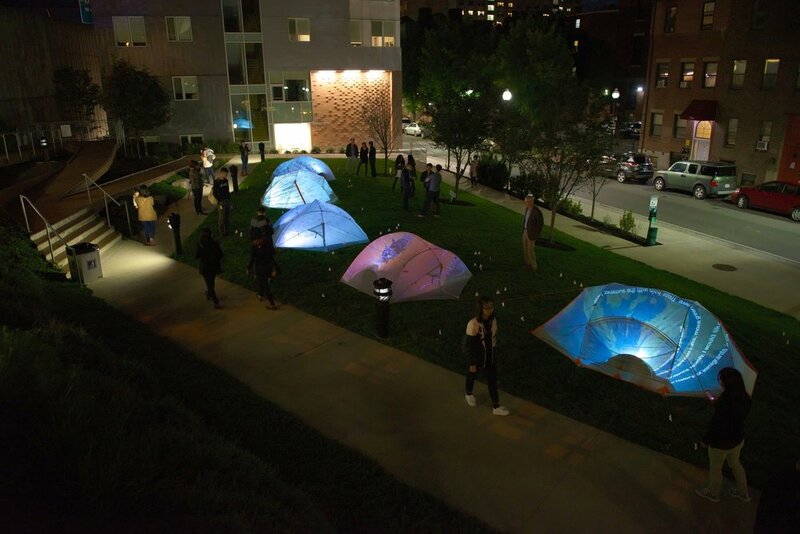 Five tents, symbolic of the housing struggle in Boston’s Chinatown, served as the canvas for projected images and words, layering anecdotes and imagery of housing and environmental concerns, as well as other community issues. The installation is the result of weekly meetings that artist Yu-Wen had with ACDC’s 66 Hudson residents and A-VOYCE youth program participants. Facilitated discussions had the youth and residents learn about the history of displacement in Chinatown while exploring patterns of displacement in their own lives. The group also brainstormed how to foster intergenerational and multi-lingual communities through storytelling, learned about the history of resistance though art and culture, and shared with Yu-Wen their ideas and visions for the project. Many community members came out to view the installation, including longtime and new Chinatown residents and passers by who were compelled to stop and learn more. Yu-Wen’s piece invited guests to be part of the installation by writing reflections of the art and thoughts on climate change on flags posted around the tents. This installation embodies why ACDC believes in placemaking or as we like to call it, “placekeeping”. We not only want to engage residents and community members in participating in creative projects that advocate for community needs, but more importantly, we encourage and support them in leading the discussions and activities. As a result, these public installations invite others to join the conversation. The goal is not just to emphasize the urgency of the challenges and struggles within a neighborhood, but to also highlight the strength and resilience of a community working towards positive changes for their family, friends and neighbors. We are excited to be unveiling our brand new ANCHOR initiative soon, which focuses on advocacy and cultivating leadership within the community through resident and youth-led creative placemaking projects. Thank you to Yu-Wen, for being such a great collaborator to work with, to our community partner, BCNC’s Pao Arts Center and to the Union of Concerned Scientists, who provided funding for the installation. If you’re interested in getting involved with projects like this in the future, click the button below to fill out a volunteer form and check “placemaking” as one of the activities.